I finally had a few hours of down time today, so I spent them cuddled with Cooper catching up on this season of So You Think You Can Dance auditions. Nothing says summer like my favorite reality show : ) And just in case you wanted to ask…yes, I do think I can dance! And that Dad Dance Off had me laughing out loud. I think Cooper may have missed that one. He curled right up on my lap and then when I got up to move around the laundry, he stole my spot, where he slept with little kitty dreams and twitchy ears through most of the show. Meanwhile, tomorrow’s dinner cooked in the crockpot as I delayed getting off the couch to make tonight’s dinner. Eventually, I hit pause and dragged myself into the kitchen. Thankfully, I had picked an easy recipe for tonight’s dinner, Greek Flavored Turkey Burgers. Which were inspired by the pita and roasted red peppers hanging out in my pantry and expanded with some Costco favorites. The BOY arrived home and packed up his pita quickly running off to eat it, so I didn’t get a good sandwich shot. I did make it through most of the episodes on my DVR though, so that’s a win! So much got packed into June that I almost couldn’t find the post with my 4 small goals written on the bottom of it. But I did. And I am thrilled to say that I rocked 3 out of 4 of them! I had active and healthy vacations and came home and dove right back into my daily ab work (which was a little lax on vacation) and strength training. Missing this month was trips to the farmer’s market, but that’s what July is for right?! On a totally different note, I finally reached my goal of doing a pull up!!! 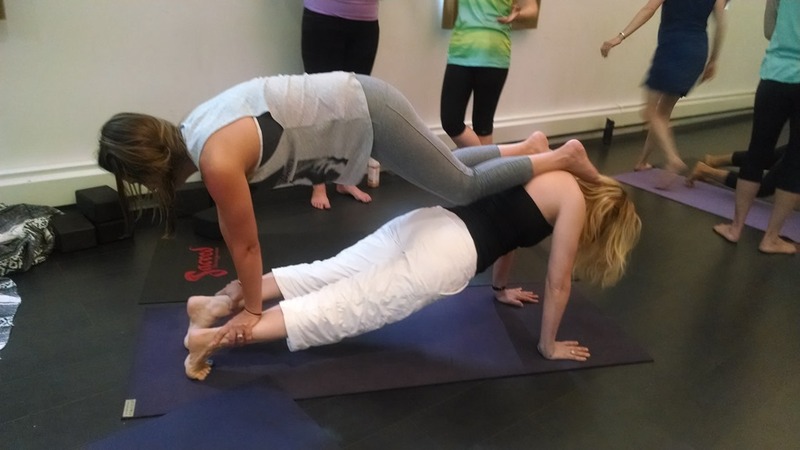 And…I’m heading into the second half of this year feeling centered and grounded after a month full of yoga! Place egg white in a large bowl; lightly beat with a whisk. Add onion and next 6 ingredients (through turkey); stir well to combine. Divide turkey mixture into 4 equal portions, shaping each into a 1/2-inch-thick patty. *I made smaller patties to fit into our pita pockets. Heat a large nonstick skillet over medium-high heat. Coat pan with cooking spray. Add patties to pan; cook 6-8 minutes on each side or until done. Place patties on bottom halves of hamburger buns or into pitas. Divide peppers evenly among burgers; cover with top halves of buns. Are you setting summer goals? I can’t believe it took me this long to get around to writing this post, but I wanted to make sure that I had the time to really think and reflect on my experience in New York. This opportunity came Wednesday night when I found myself walking in the door at 6pm. Me…home by 6pm on a weeknight when I’ve already gotten in my run (30 minutes early in the morning) and it’s raining so I can’t fit in a bike ride…what’s a girl to do? I spent some extra time loving and brushing Cooper, got started on making dinner, and then sat down to begin Sherlock Season III and blog a bit. But I never blogged a bit and then the rest of the week got away from me. Better late than never…right?! I have been practicing yoga for over 10 years. I took my first class my senior year of college (don’t do the math) and was forever changed. Over the past 10 years, yoga has served many purposes in my life. There have been times when my practice is more consistent than others, but I have never strayed far from my mat. In my job as a pediatric physical therapist, there has been plenty of room for yoga. It is something that I have often recommended to my patients of all ages and abilities. Even at my first job, I was this close (my fingers are very close) to taking a kids yoga certification. Over the past few years, I’ve struggled to find the right place to refer my clients. This became especially obvious when I started my new job in December. It was during an inspiring yoga class downtown that it occurred to me that I should be teaching kids yoga. My next step was to talk to the professionals and research some opportunities. I didn’t take it lightly and spent way more time than I care to admit looking for yoga certification courses. I really wanted an affordable, weekend course that I would walk away from with ideas that I could use immediately. After much thought, I registered for the Rainbow Yoga Kids course in Brooklyn. The course was coming to Chicago, but not until December and I was eager to take the class before summer in hopes of starting some yoga classes at work. I am so grateful to have family in NY along with a close friend from junior high, and I knew Brooklyn would be an awesome place to explore my inner yogi. I flew in Thursday morning and spent the entire day catching up with my cousins and playing in Manhattan. Friday morning, I woke up early to take the train from Washington Heights to Brooklyn. I was the first to arrive at Scared Yoga and was greeted warmly. I was early enough to grab an iced tea before beginning my first day of training. I had no idea what to expect and the first day impressed and surprised me! There was playing, dancing, bonding, and fun. At the end of the day, I was eager to see what the rest of the weekend had in store. One of my favorite things about doing my training in New York was walking to and from the studio each day. I walked 2 miles through the most interesting and eclectic neighborhoods and LOVED the fresh air and exercise. And other games, acrobatics, and play ideas. We did more dancing too! A group of us went to a local pizza joint. You didn’t think I’d go to New York for a weekend without eating pizza did you?! After lunch, there was more games, dancing, meditation, and plenty of ideas to bring back to the clinic with me! At the end of the day, we offered a community class for local families. It was profound to see the impact yoga could have on everyone, especially the cutest 2 year old that you ever did see massaging my feet during our relaxation. That night, I walked back to my friend’s house, showered, and began exploring Williamsburg. There are tons of adorable boutiques and delicious restaurants. We had a great night with more incredible food and catching up! Sunday morning, it was back to the yoga studio for my last day of class. Now that I kind of was getting a feel for the area, I knew where to stop for a chai tea latte on the way. The instructors plan was to not give us our manuals until the last day. Although it was tough not to have everything written out during the first 2 days, it really forced us to live in the moment and learn through movement. Sunday started with a creative and unique obstacle course complete with…well, everything! Then we had a snack and a chat…by day 3, I’d say we were all pretty close and eager to share stories and ideas! It was good to have the energy since we then moved on to the yoga gym and acrobatics. As an ex gymnast, this was right up my alley and I’ve already tried some of these moves with the kids, which they love. 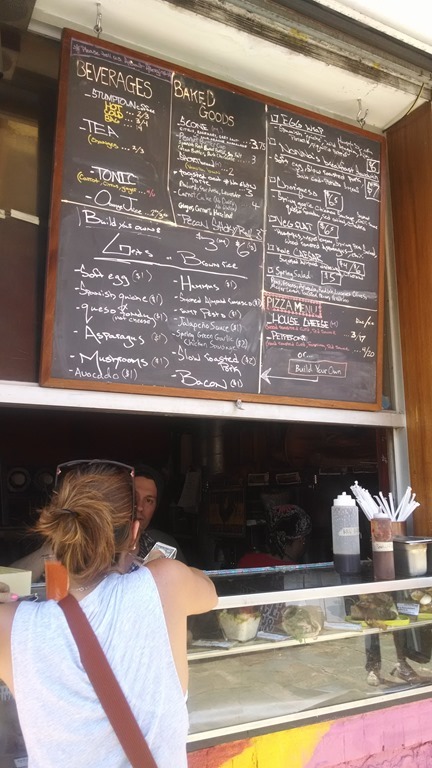 For my last lunch, I went to my new favorite place in Brooklyn, called Scratch Bread. It has the most delicious food (thinking about the grit bowl has my mouth watering as we speak) and I became addicted to this ‘tonic’, which consisted of citrus, carrots, and ginger. It was so refreshing and perfect for eating lunch out in the hot sun after a morning of yoga fun. Although I had learned a lot, I still felt like there was more to fit into the last afternoon and I knew that I needed to leave a little early to make it to the airport on time. The afternoon involved creating poses, vinyasa flows, and stories. It was also our chance to put together a short sample class. We took our graduation picture and parted ways with intentions to continue on our yoga journey and keep sharing ideas and energy as we grow! 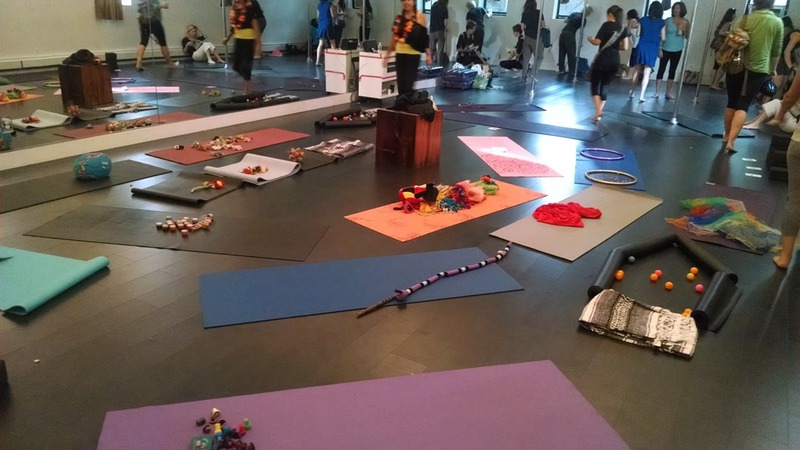 I found myself sad to leave Brooklyn, Sacred studio, my friends (old and new) and family…wishing that I had just a few more days to explore, walk, dance, and play! What were my overall thoughts of RKY training? I loved it! 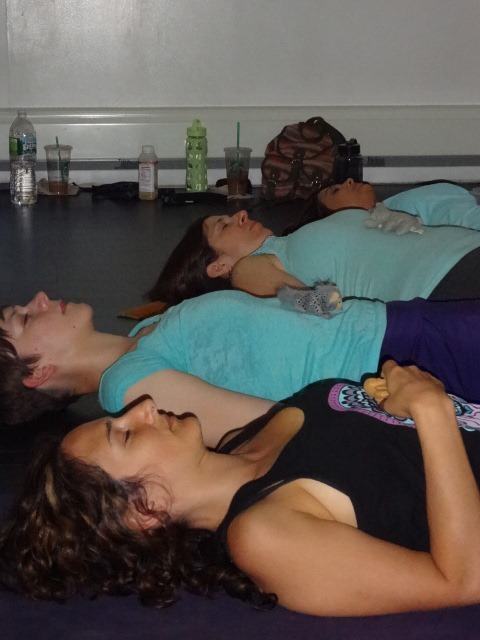 I loved spending the weekend in New York and immersing myself in the Brooklyn and yogi lifestyle! It was special to spend a weekend with like minded people soaking up their energy and creativity. The training itself was practical, functional, and fun. I returned back to the clinic with more than enough ideas to plan the 6 week yoga session we were offering for my youngest two age groups. I did not feel that I got as many ideas for the high school aged group. And the weekend focused more on movement and games than it did on instructing kids into the basic poses (ie Warrior I). I got more than I anticipated out of the weekend and have already found some other trainings that can fill the knowledge gap with the older groups that I am hoping to take soon. We packed a lot into 3 days that takes you through a slew of emotions. For some, this journey was more emotional while others purely educational, but either way it was a life altering weekend and the start to an exciting road ahead. Ahh…one week into summer and I am loving me some Saturdays! This morning, I woke up, got in a good cuddle with Cooper, and then made breakfast. Instead of my usual eggs, I went with a Quinoa Cake. Yum! Although I didn’t have any bananas, so I smothered it with almond butter, agave, and coconut. It was fantastic! And gave me more than enough energy to power through an awesome and inspiring hot yoga class. Let me tell you…my dancer pose has never looked felt so good! After yoga, I spent some down time on the couch watching trashy TV. 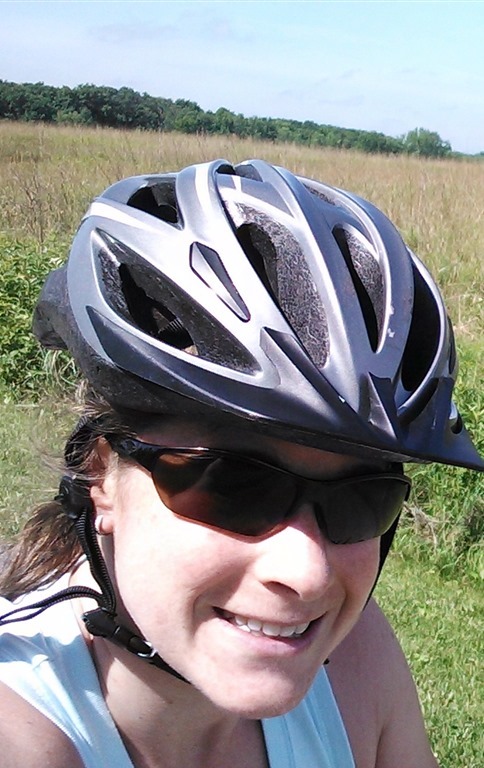 Then, packed up my car to meet a friend for a bike ride and a run. She is training for her first triathlon, so I offered to tag along to keep her company and live vicariously through her since this is the first year in a few that I am not training for a triathlon. This is the same friend that I ran the 10 Mile Coffee Date with, so there is always plenty to talk about. 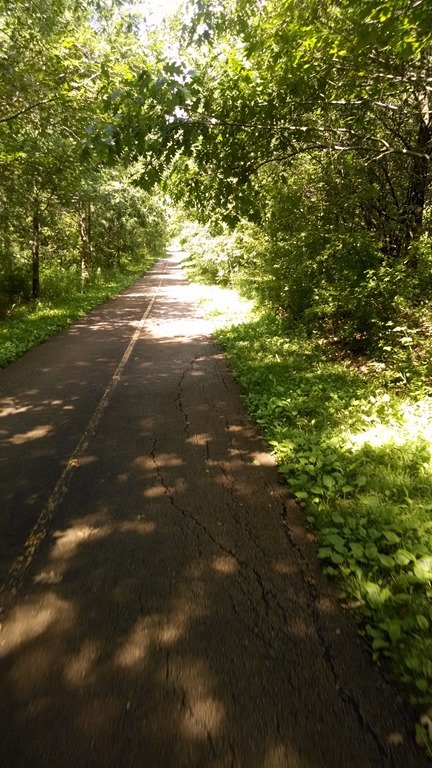 We rode along the Des Plaines River Trail, which was beautiful. It was really fun to ride a different trail and get a new perspective and of course, workout with a friend. There was a little flooding, so we got slightly sidetracked on our way north, but easily made our way back. We were talking so much and enjoying the sights (we saw a deer) that I barely took any pictures. After our 130 minute bike ride (a little over 20 miles), we locked up our bikes and set out on the next portion of our workout, a 20 minute run. This was my first BRICK since last summer and my legs felt heavy and slow, just like they were supposed to. And I felt happy and strong, just like I expected! Now that’s one happy day! How do you like to spend your summer Saturdays? I seem to remember when I started this blog, there was a lot of cooking, baking, and recipes going on. Sometime last year, as life got complicated and stressful, I decided that some aspects of my life needed to be simplified. I don’t think it was a conscious decision to have making dinner on that list, but it seems over the past 6 months, I have relaxed a bit on the cooking…in a good way! It has been easy to share that responsibility with the BOY since he is home early some nights and loves to grill. This weekend, I had some spare time and was more than happy to get myself back into the kitchen for some cooking. I made a few remakes of old recipes from the blog (if you haven’t seen my recipe page, it’s pretty expansive) and one new recipe from a cookbook. To keep things simple, I used a crockpot cookbook and a recipe that uses easy to find household ingredients. This meal was planned for tonight, but I made it yesterday while I was embracing my productivity. This ended up working out well, so that the BOY could heat up his dinner when he got home from the library which is before I get home from work. Except…that the BOY forgot whether he was supposed to eat the Indian or the Asian food in the fridge for dinner tonight. He went with the curry (don’t tell him that he ate eggplant, he doesn’t know), which left plenty of this delicious dinner for me! Combine hoisin sauce, sherry, ketchup, soy sauce, ginger and red pepper flakes in a 5-6 quart slow cooker. Stir in chicken and water chestnuts. Cover cook until chicken is tender 3-4 hours on high or 6-8 hours on low. *I ended up cooking mine for about 5 hours on low. About 20 minutes before cooking is complete, mix up cornstarch and water until smooth. Stir in cornstarch and veggies into slow cooker. Cover and cook on high until mixture simmers and thickens and veggies are tender (about 15 minutes). Serve with brown rice or noodles. I had another crazy productive day…so much so that I almost didn’t get a chance to sit down and share the amazing breakfast that I made to fuel me through this busy day. I had leftover Roasted Rosemary Potatoes from last night’s dinner and decided to use them to make a frittata this morning. I layered my potatoes with eggs and egg whites, wilted spinach, and my favorite breakfast seasoning, Vulcan Fire Salt. Then baked it in the oven until the edges were starting to brown and the center set. The only bad thing was that I forgot to add in some herbed shrimp that I had in the fridge. That would have been the perfect finishing touch. This frittata makes enough for breakfast leftovers later in the week. Woo hoo! I smothered my egg with salsa and enjoyed it with a delicious cup of chia tea. Mmmm! Then it was off to the tailor, the gym, the hairdresser, the eye doctor with a few other stops along the way. This breakfast takes a little extra time and planning, but is totally worth it! Spray baking pan with cooking spray. Layer with potatoes. Meanwhile, place olive oil in small frying pan. Add spinach and stir until wilted, about 5 minutes. 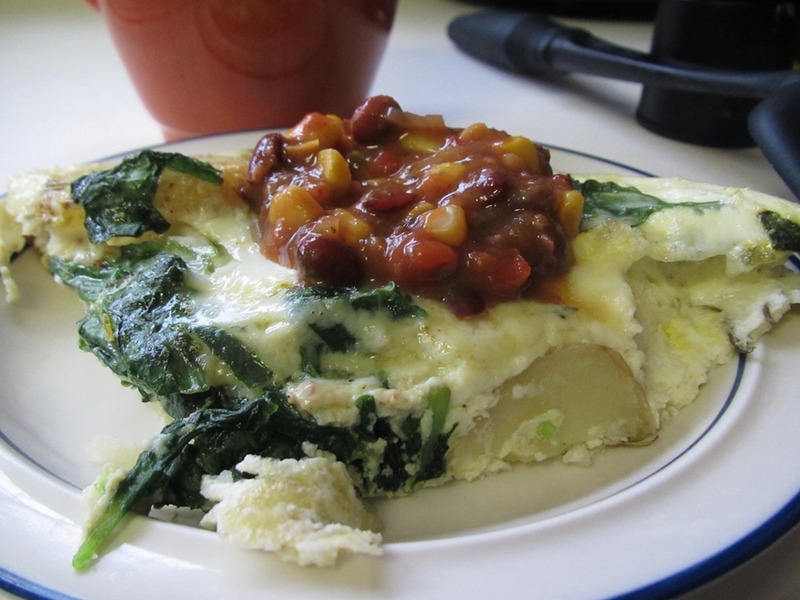 Layer spinach and eggs over potatoes and sprinkle with salt (and any other seasonings you desire). Bake for 40 minutes until the center is set. Are you exhausted already? I also had time for a dentist appointment, yoga workshop, lunch with my parents, shopping with my mom (I bought 3 new dresses which will be perfect for wine tasting in California), and laundry. There is still plenty to do tomorrow, starting with getting my bridesmaid dress fit for my brother’s wedding which is 3 weeks away, but after working through my to do list, I feel better already! I slept until 9am this morning, which felt incredible! I ate breakfast and headed out into the humidity for a bike ride. I haven’t ridden in a few weeks, so I was excited to take my bike out. My legs, however, were not so excited! After Thursday’s leg workout complete with lots of lunges and squats and yesterday’s run, my legs were done. I felt like I was pedaling against the wind 100% of the time, which considering I was biking in a loop couldn’t really be possible, right?! My bike is also making some strange noises, so when I got back home, I tried to schedule an appointment at the bike shop. Not surprisingly, they are booking about 2 weeks out, so I will have to wait. After a shower, the BOY and I ate lunch together before he went off to the library, and I hung out with my parents. I was really eager to go to the farmer’s market since it just opened and they had limes for 7 cents each! The market is dangerously located in the middle of a mall, so my mom and I also found ourselves at Sur La Table, The Loft, and a few other stores. My parents went on about their way and I hit up my last stop, the grocery store before making my way home for the day. Since we had a quiet night in last night, I used that time to plan out this week’s meals. The BOY was home from the library when I walked in, and I found him napping upstairs. I have been pretty spoiled with the BOY grilling dinners and making many of our meals, but as each week goes by, he is studying longer and getting home later. So, I went back to some of our favorites (with the help of my crockpot) for this week’s meal plan. To go along with tonight’s meatloaf, I picked up some beautiful looking potatoes at the market. Rosemary potatoes is one of our favorite sides, especially during grill season. They are so easy to make in the oven and are usually a crowd favorite. I love to make extra too to enjoy with my eggs as leftovers the next morning. Yummy! Place foil over a baking sheet and spray with cooking spray. Place a single layer of potatoes, overlapping a little as needed, across the baking sheet. Drizzle with olive oil and use a brush to spread evenly over the potatoes. Sprinkle with sea salt and rosemary. Place in preheated oven for 20 minutes. Then remove potatoes and flip them over adding more sea salt and rosemary. Return to oven for 15 to 20 minutes until crispy along the edges. I like mine well done! Were you productive this weekend? It is the longest day of the year and we were back home indoors at 5:30pm because there was a raging storm (complete with flood warnings) outside our windows. Boo! We’ve had storms on and off all week, so it’s not really that surprising. Thankfully, the day started off clear enough for me to go out for a 5 mile run! After my run, the BOY and I had back to back dentist appointments (no dental selfie required). It ended up running late, so I arrived 5 minutes late to the 1:30 Summer Solstice and Silks workshop I was attending at my yoga studio. My mom got there ahead of me, so I was all set with a mat and silks. We began the workshop talking about the summer season. We wrote down on a piece of paper something that we want to leave behind us as we head into summer and then wrote down our specific intentions for the summer ahead. We started the first hour with an invigorating aerial yoga class. I was 100% engaged ad didn’t stop to take many pictures. Then, we climbed into our silk hammocks for the most refreshing shivasana ever! While we listened to the sounds of the crystal bowls, we sank deep into medication intended to open our chakras for the season ahead. I don’t have the easiest time meditating, but found the hammock and music to be serene. Although I often pushed out subconscious thoughts, I managed to stay somewhere between awake and asleep for the entire hour! We sealed our practice and regrounded with a delightful taste of chocolate. It was a beautiful way to spend an afternoon, especially since I shared it with my mom! Afterwards, we ran a few errands together, and I arrived home in the heart of a thunderstorm. I got myself safely inside and changed into clean, dry, comfy clothes. Our game plan for dinner was ribs with the BOY’s Christmas present BBQ sauce. By the time they were ready for the grill, the rain had slowed and when the BOY removed them 30 minutes later, the sun had almost returned. We ate our tasty dinner with an easy summer salad and roasted broccoli. I am not usual a big fan on ribs, but these were fantastic! Also fantastic…after two weekends of traveling, spending a quiet Saturday night in with Cooper and the BOY working through our DVR. Did you do anything special to celebrate the Summer Solstice? Here are a few more photos of high flying fun from my first aerial yoga workshop!